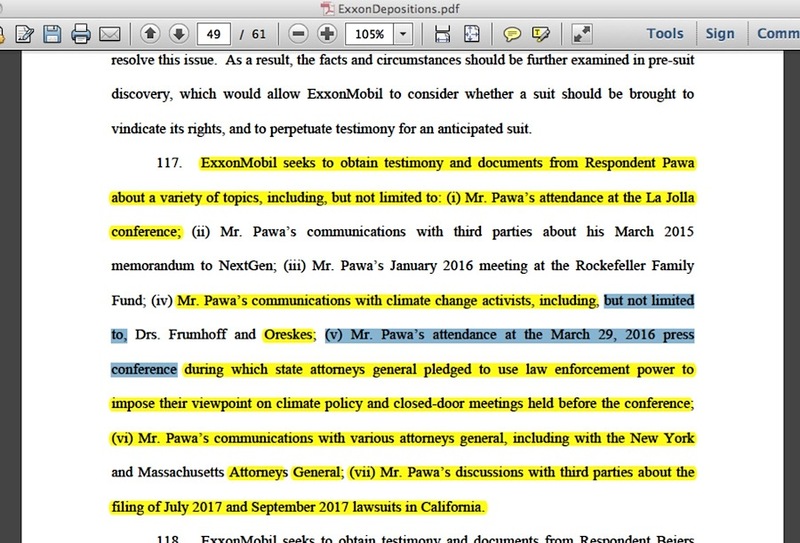 In my work here, I follow the citations for ‘evidence’ which supposedly supports the accusation about ‘corrupt industry-paid lying skeptic climate scientists.’ But continuing on the theme I suggested at the end of my February 8, 2018 blog post — oil company lawyers and potentially other investigators examining correspondences of enviro-activists “not limited to” Naomi Oreskes — another name to keep an eye out for is Phil Radford. If lawyers / investigators / reporters ‘follow the proverbial money‘ with him, it could lead them to the core of people surrounding the inception of the ‘crooked skeptics’ accusation. 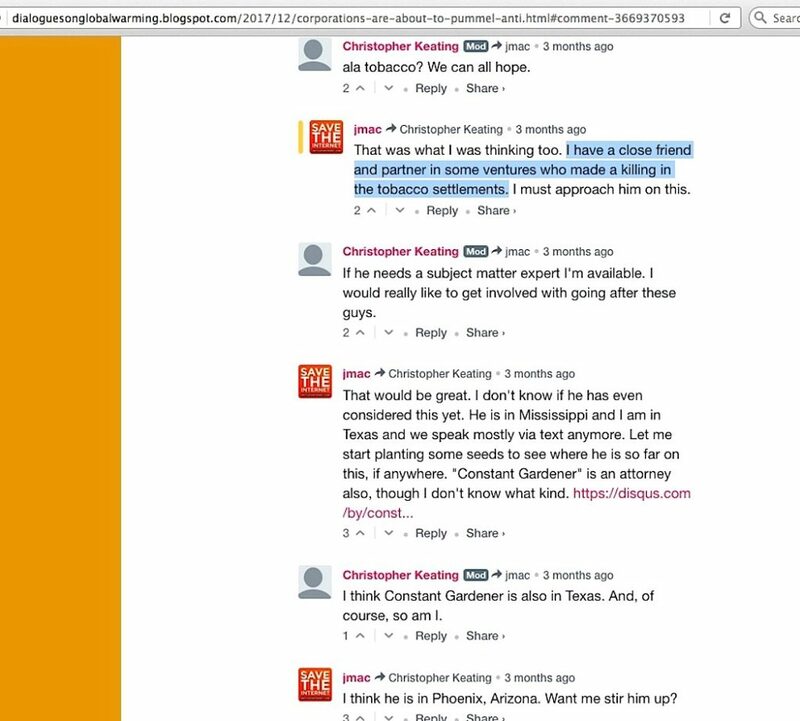 Steady followers of this blog know who he is, but for the sake of newcomers arriving here, allow me to frame this situation from the perspective of how an objective reporter / investigator /energy company lawyer might stumble across him, in which a follow-the-money exercise can lead to the origins of the ‘crooked skeptics’ accusation. The point is to illustrate how the larger political angle of the global warming issue is never as straightforward as it seems. 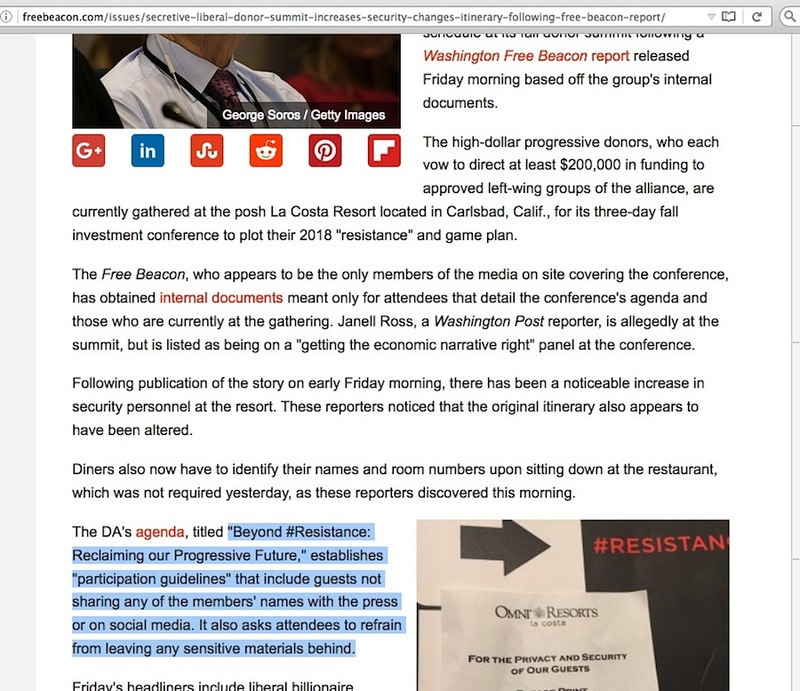 Apparently, somebody left the Democracy Alliance conference agenda papers behind for Free Beacon reporters to find. 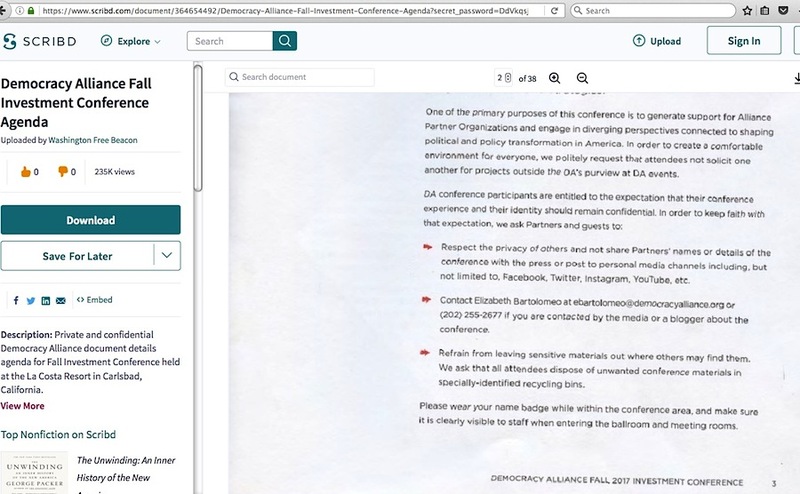 The ‘celebrity’ names of US House minority leader Nancy Pelosi and billionaire George Soros may be recognizable for people having a good familiarity with politics, however, apart from the “sensitive materials” warning, the rest of the content and guest speakers don’t initially appear to be especially attention-grabbing. 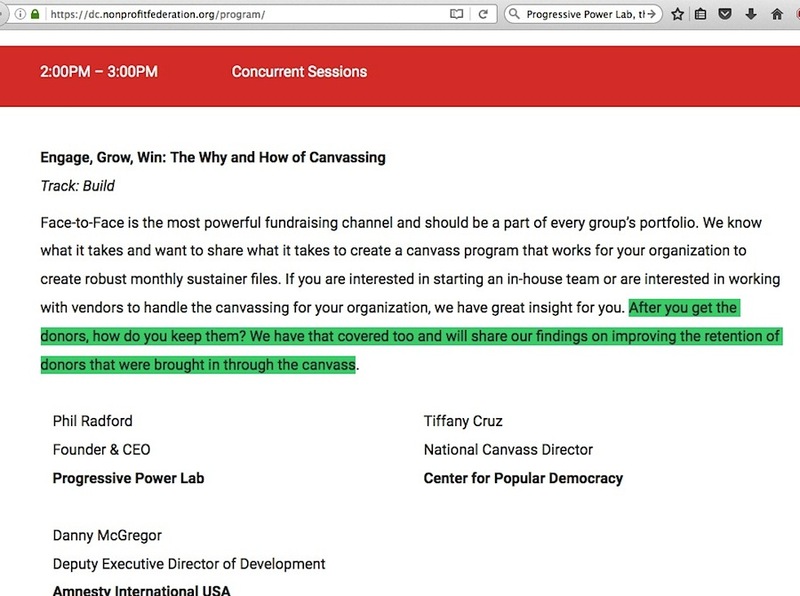 It’s quite dull material on session talks, having not especially interesting or memorable titles, mostly. 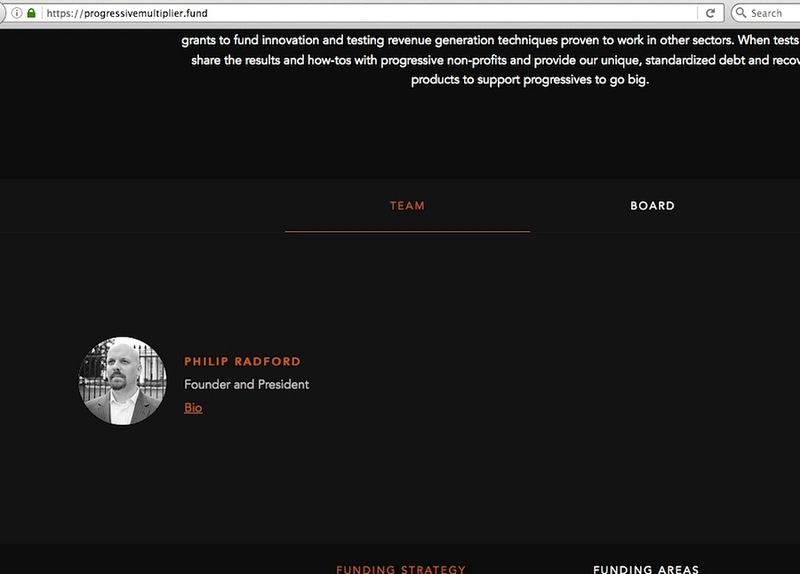 More Money More People for More Change – Progressive Multiplier Fund President and Founder Phillip Radford will discuss how funding replicable innovation in small dollar fundraising could unlock the full potential of the progressive movement. 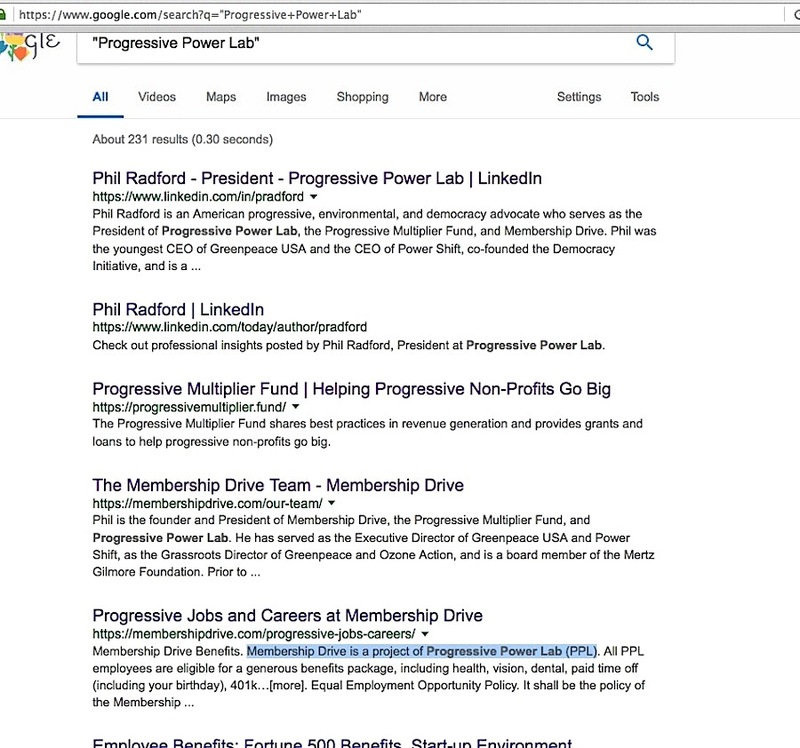 Phil Radford is the founder and President of Progressive Power Lab, the Progressive Multiplier Fund, and Membership Drive. He has served as the youngest executive director of Greenpeace USA, cofounded the Democracy Initiative, was founder and executive director of Power Shift, and is a board member of the Mertz Gilmore Foundation. He has a background in grassroots organizing, corporate social responsibility, climate change, and clean energy. 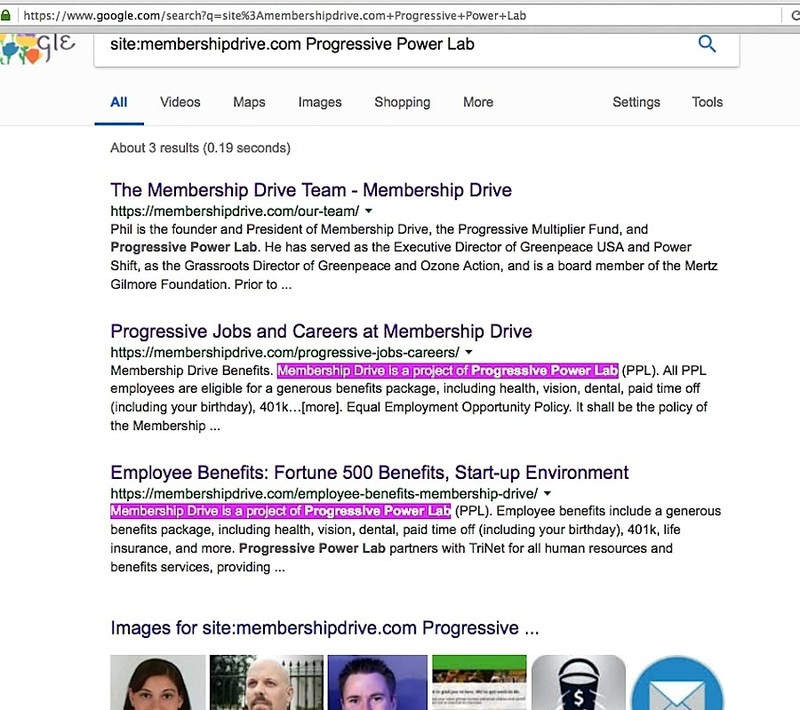 Ok. “Progressive Power Lab?” What’s that? 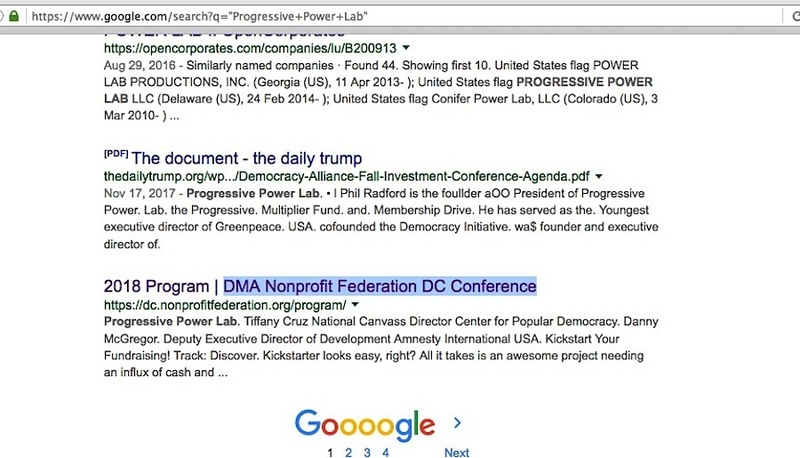 Drop those words (placed between quotation marks for more focused search results specifically on that combination of words) into an internet search, and one of the top results points right back to the Progressive Multiplier Fund page you just left. 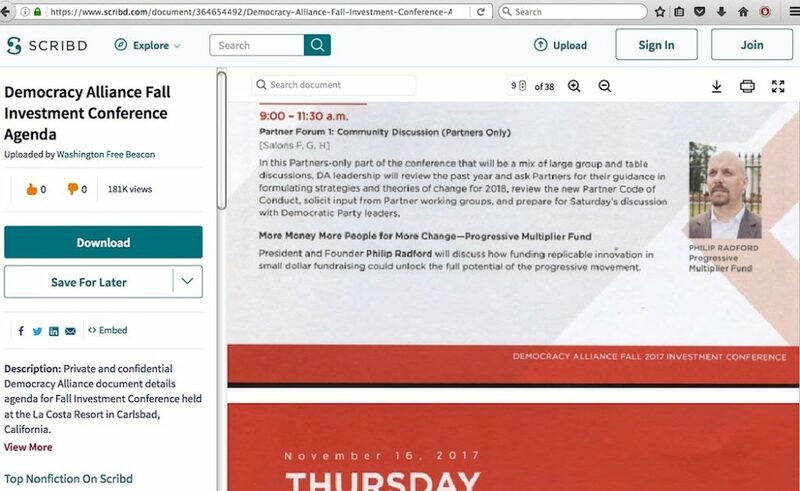 Another points to a February 22, 2018 “Data & Marketing Association” conference agenda page in which Radford is clearly a guy who helps nonprofit organizations to ‘keep their donors.’ Two of the other search results say “Membership Drive is a project of Progressive Power Lab,” and directly above that is the link straight to the “Membership Drive” organization mentioned in Radford’s Progressive Multiplier Fund website bio. 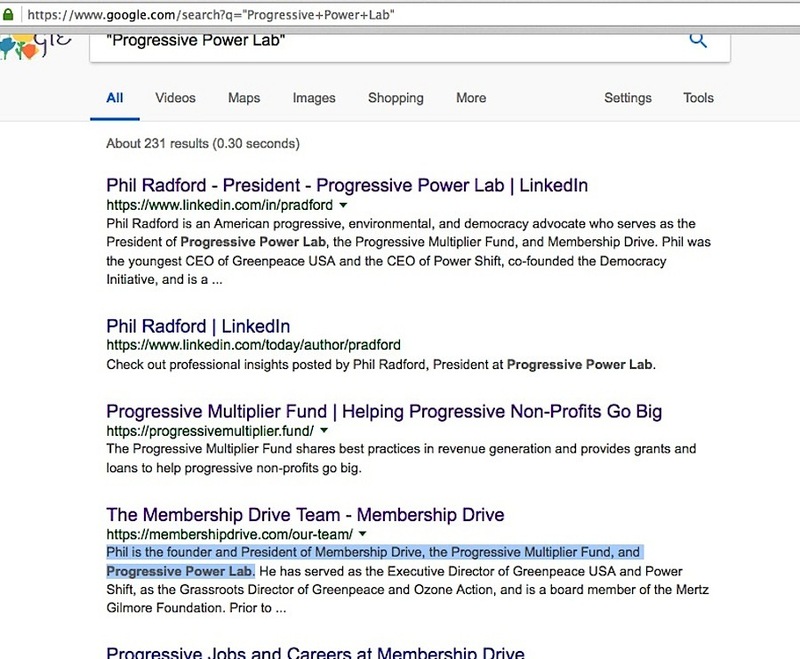 What happens when you click on the internet search link result for the “Membership Drive” organization, which is yet another site dedicated to providing “advisory services for global and local grassroots fundraising programs“? 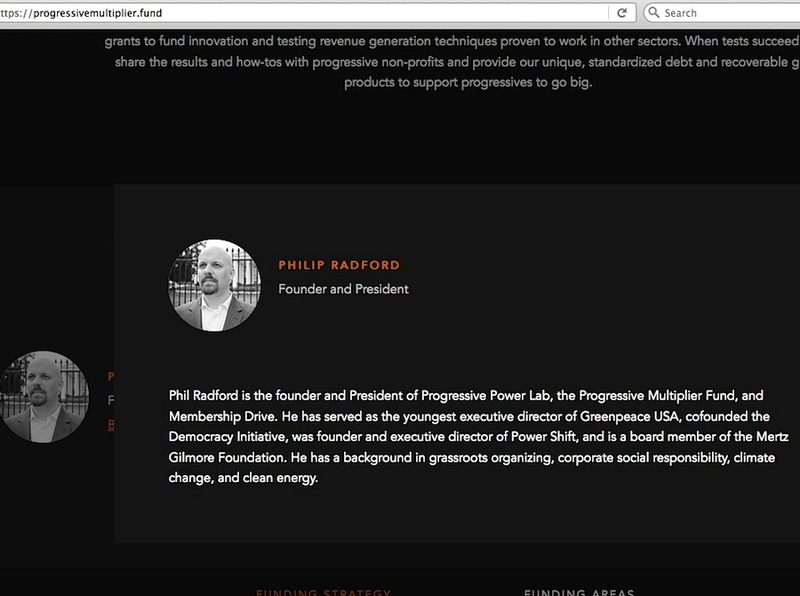 You get a page featuring Radford’s bio where there’s no clickable links for “Progressive Power Lab” or “Power Shift,” the other organization Radford’s Progressive Multiplier Fund bio said he founded. 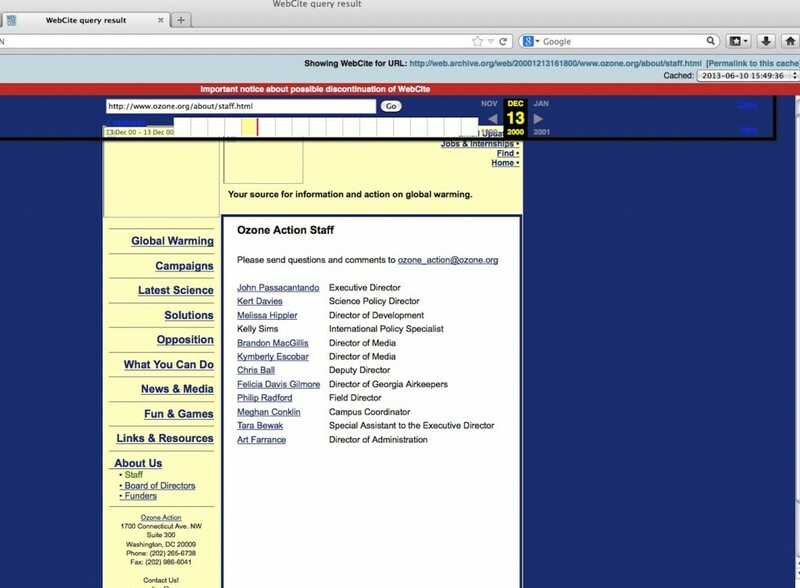 Nor is there any link to “Ozone Action,” which doesn’t appear at Radford’s PMF bio — hold on to that thought for a moment. Surely an organization which is a project of another would proudly describe at some length what its parent organization does. 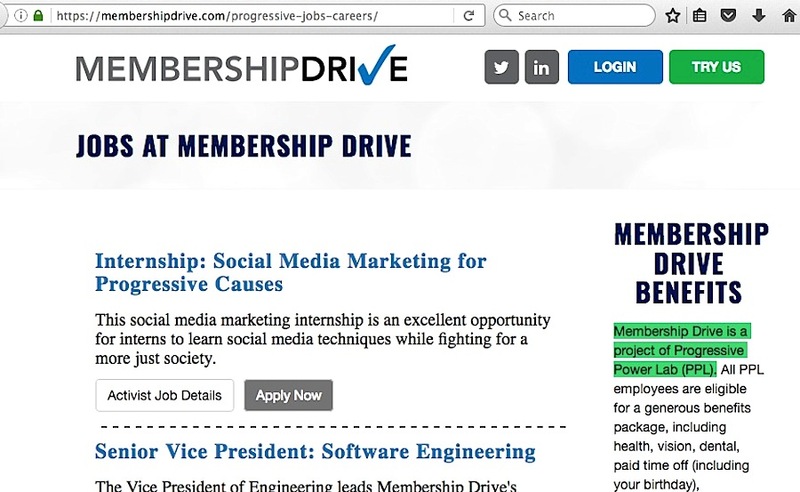 Do a site-specific search of Membership Drive, and you see that it does not – the links shown there only lead to identical declarations seen in the internet search results. Ditto for a site-specific search at Progressive Multiplier Fund. 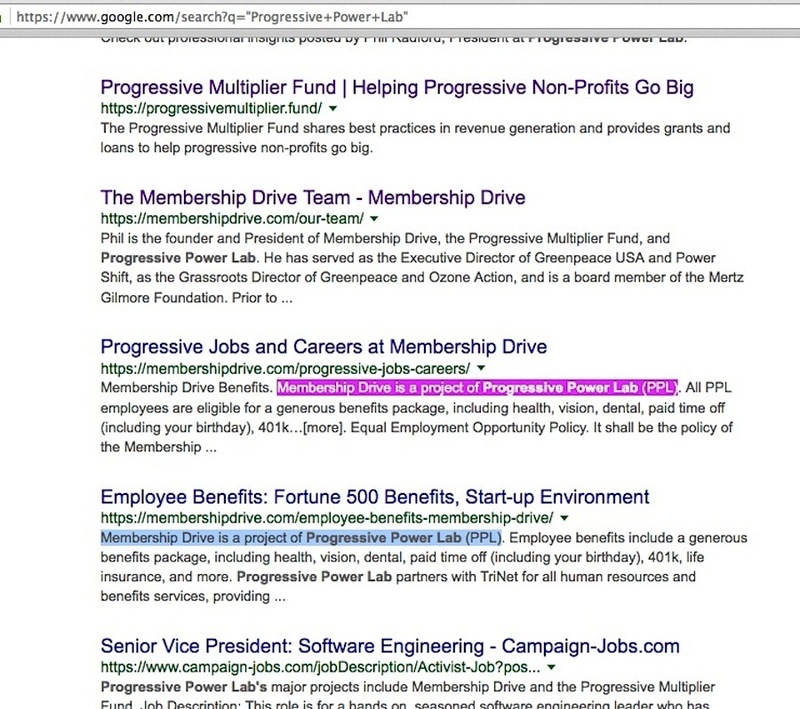 Keep on digging, and you won’t find an actual website for Progressive Power Lab, you’ll just find things like employment position requests which say Progressive Power Lab created Membership Drive and Progressive Multiplier Fund. Meanwhile, Ozone who? Good luck on finding out what that organization was, past tense, unless you undertake far more intensive searches, like the way I did. 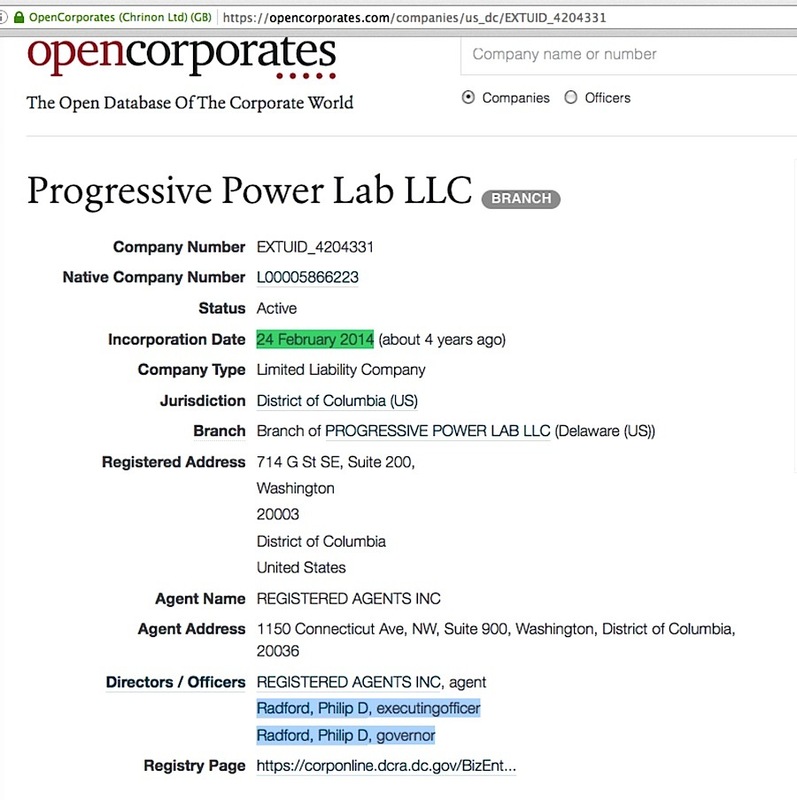 Same thing about Radford’s Power Shift mystery organization, which I detailed in my April 18, 2014 blog post. I can’t emphasize this enough: examinations of key enviro-activists’ activities must not be superficial, and it’s a huge mistake to accept these individuals’ narratives at face value. The deeper you look into them, the more they turn into tangled messes. Case in point is this one surrounding Phil Radford. 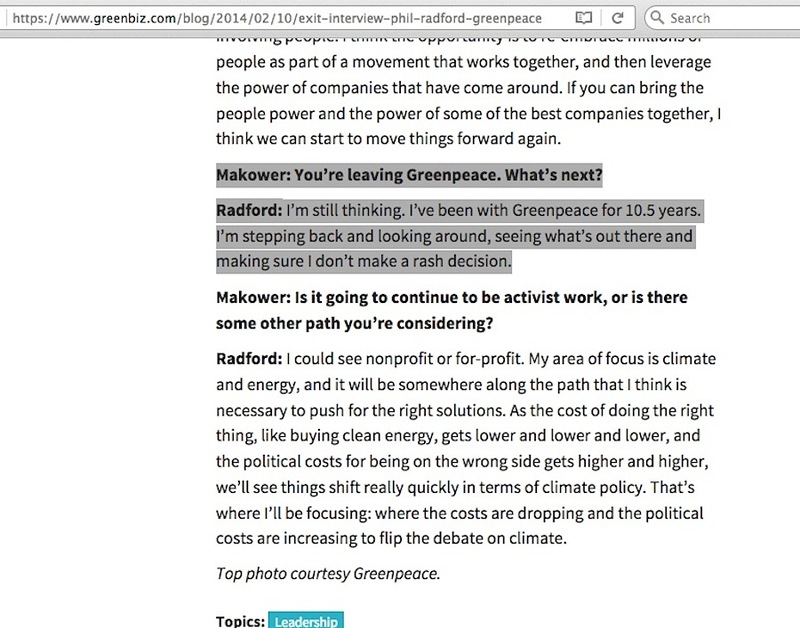 When he announced his impending departure from Greenpeace in early 2014, on more than one occasion in ‘exit interviews,’ he was very vague on where he was headed and offered essentially no explanation of why he felt any need to leave. 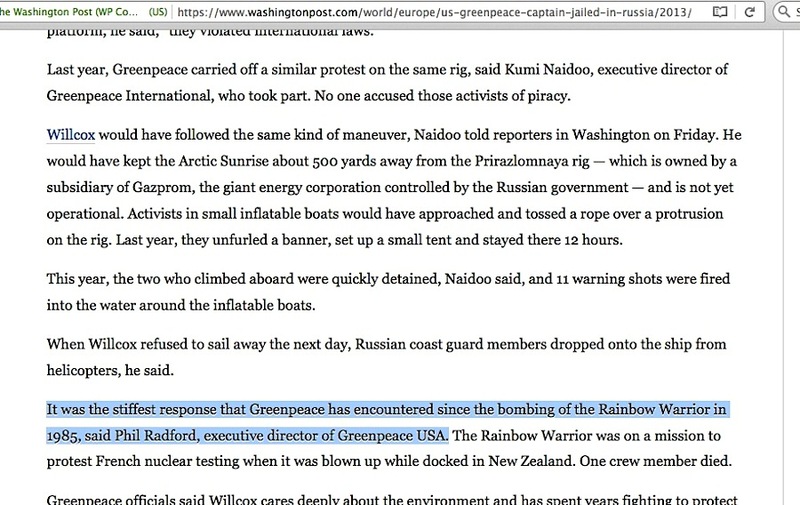 When I read announcements at that time, I don’t recall any which explored public backlash against Radford’s role in the chilling controversy where thirty Greenpeace activists were arrested and held in Russia for a protest stunt at a Russian oil drilling rig. 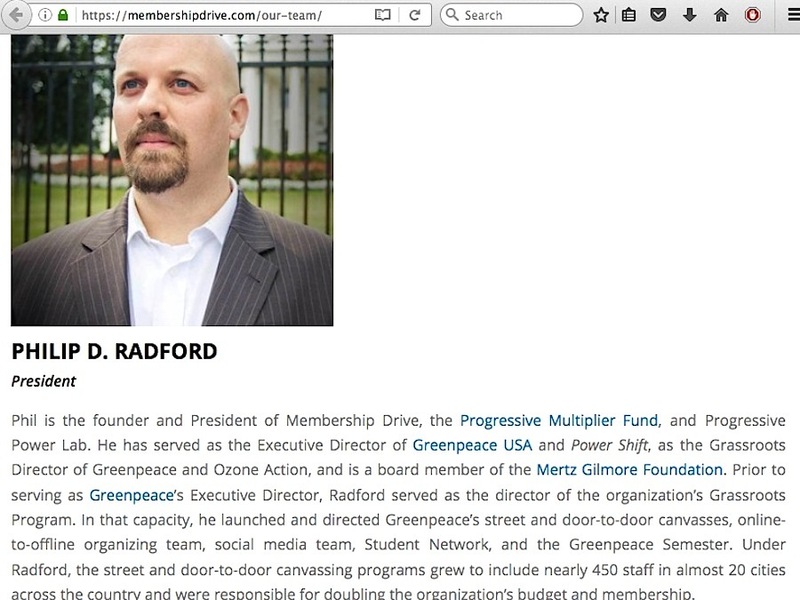 Radford wasn’t among them, while the Greenpeace International Director participated in a similar stunt a year earlier. My uneducated guess in the Spring of 2014 was that since Radford ineptly placed people in a seemingly unexpected extreme and traumatic situation with this stunt, disgruntled powerful Greenpeace people expelled him. 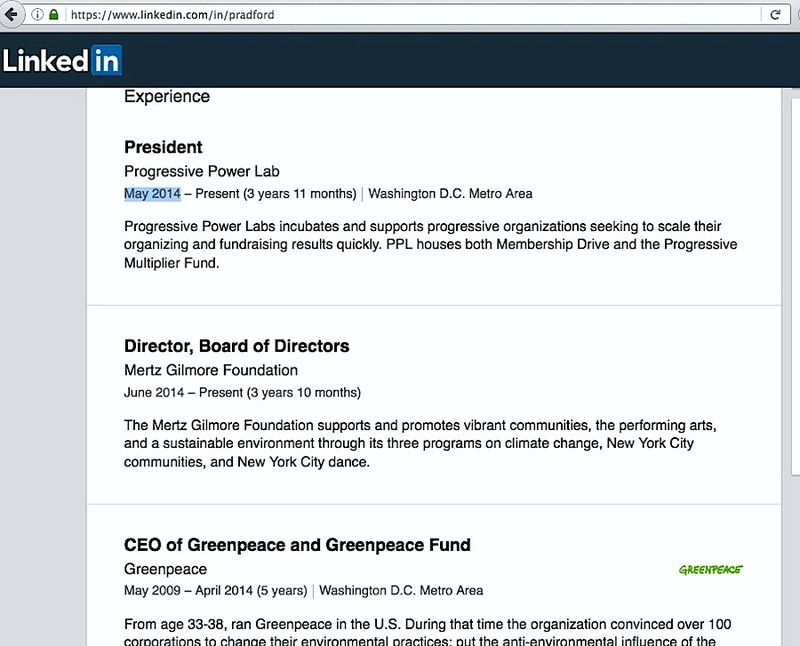 But his last day at Greenpeace was apparently at the end of April, and his LinkedIn resumé indicates a seamless transition from one job to the next. 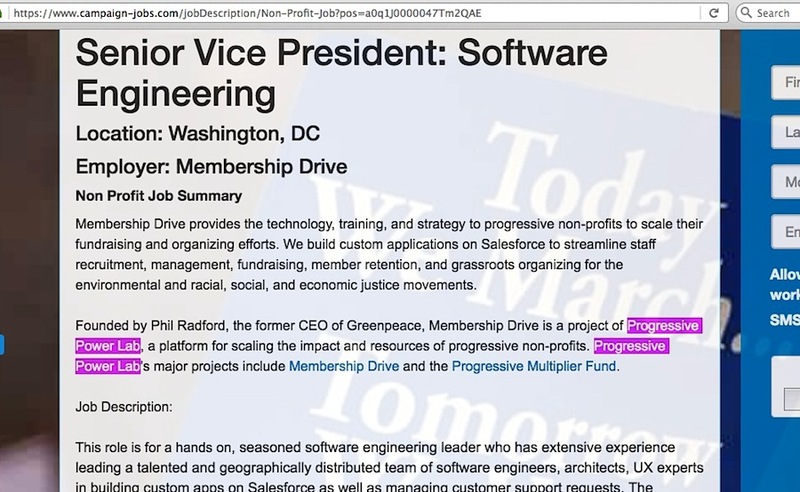 If he was busy setting up Progressive Power Lab during that February-to-April time, would he have billed Greenpeace for zero hours worked, just like John Passacantando did when he exited Greenpeace before Radford? There’s no profits to be had in protesting man-caused global warming, unless you can somehow get into the act of being on the receiving side of payouts from oil company defendants in global warming lawsuits (at least one person has used ironic wording to describe profiteering from the tobacco industry settlements). 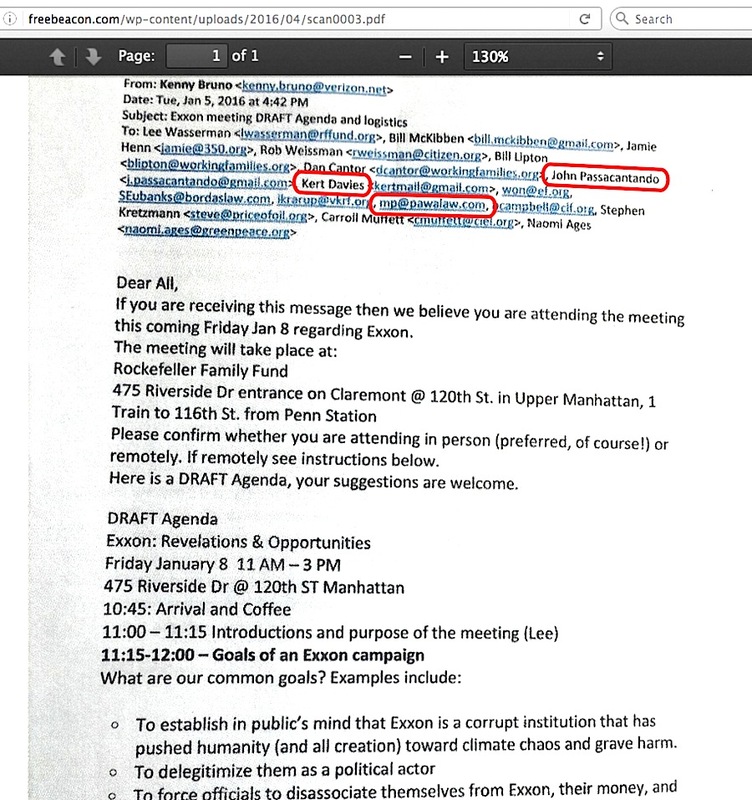 Before payouts can occur in any fashion, organizations like Climate Files and guys like John Passacantando and Kert Davies (who earlier were in ‘trio form’ with Radford at Ozone Action) need big piles of cash to run their let’s-nail-Exxon efforts. This entry was posted in Ozone Action and tagged Phil Radford by Russell Cook. Bookmark the permalink.